Arsenal have appeared in 18 previous FA Cup finals, winning 11 of them. Reaching the 2015 final means that Arsenal have surpassed the record the held jointly with Manchester United, and a win will give them a record 12th win. 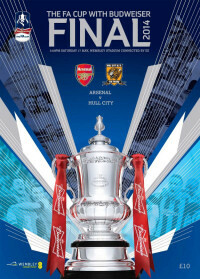 What we have collated here is a list of all the FA Cup finals that Arsenal have appeared in with match details, line-ups, match reports and some stats at the end of the article. 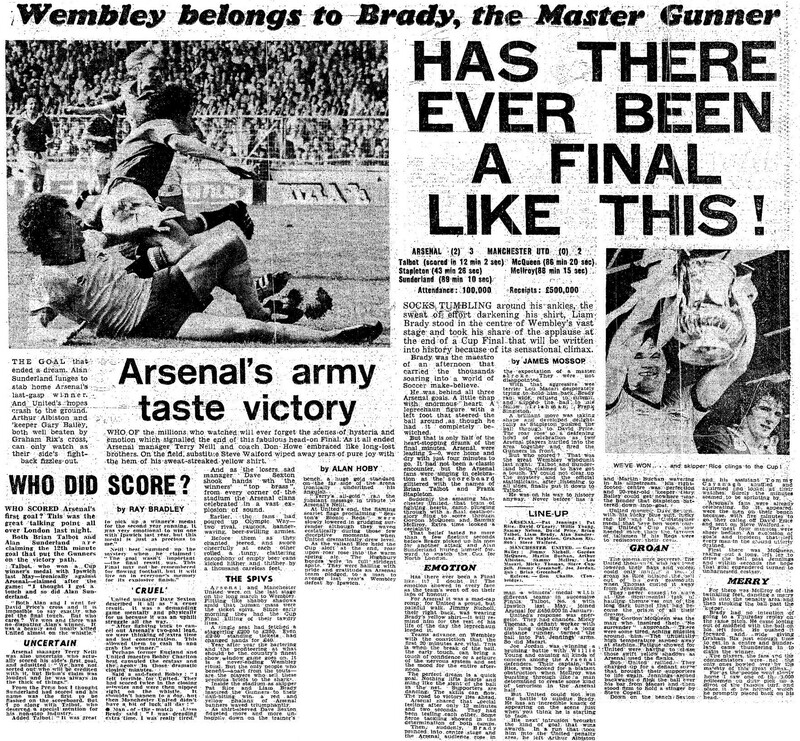 We don’t expect you to read through this all in one go, but to dip in whenever you think “who was Arsenal’s captain in the 2003 final” or “what was the weather like in the 1950 final?” We highly recommend reading the match reports, especially for the earlier finals even if it is only to see the difference in reporting styles when compared with today’s reporters. The front cover of Weekly Illustrated from 25 April 1936 was kindly supplied by @OpArsenalArt #OpAa – who produce high quality Arsenal memorabilia and impressive iconography. N.B. The 1993 final counts as one appearance. 2 – Cliff Bastin, Lee Dixon, Edu, Eddie Hapgood, Thierry Henry, Joe Hulme, Alex James, David O’Leary, Robert Pires, Pat Rice, Gilberto Silva, Sylvain Wiltord, Nigel Winterburn. 1 – Nicolas Anelka, George Armstrong, Mikel Arteta, Alf Baker, Walley Barnes, Ray Bowden, Liam Brady, Kevin Campbell, Sol Campbell, Santi Cazorla, Denis Compton, Leslie Compton, Wilf Copping, Freddie Cox, Jack Crayston, Paul Davis, Ted Drake, Lukasz Fabianski, Cesc Fabregas, Alex Forbes, Charlie George, Kieran Gibbs, Peter Goring, George Graham, David Jack, Pat Jennings, John Jensen, Charlie Jones, Kanu, Eddie Kelly, Ray Kennedy, Laurent Koscielny, Jack Lambert, Jens Lehmann, Reg Lewis, Andy Linighan, Jimmy Logie, Oleg Luzhny, Frank McLintock, Bob McNab, George Male, Joe Mercer, Paul Merson, Per Mertesacker, Sammy Nelson, Marc Overmars, Mesut Ozil, Tom Parker, Emmanuel Petit, David Platt, Lukas Podolski, Charlie Preedy, David Price, John Radford, Aaron Ramsey, Jose Antonio Reyes, Graham Rix, Herbie Roberts, Tomas Rosicky, Bacary Sagna, Yaya Sanogo, Laurie Scott, Bill Seddon, Philippe Senderos, Peter Simpson, Alan Smith, Frank Stapleton, Peter Storey, Alan Sunderland, George Swindin, Brian Talbot, Kolo Toure, Robin van Persie, Steve Walford, Jack Wilshere, Alex Wilson, Bob Wilson, Christopher Wreh, Ian Wright, Willie Young. 1 – Manuel Almunia, Steve Bould, Sol Campbell, Lee Dixon, Mathieu Flamini, Gilles Grimandi, Kanu, Lauren, Nacho Monreal, Ian Selley, Wojciech Szczesny, Stuart Taylor, Kolo Toure, Giovanni van Bronckhorst, Thomas Vermaelen, Ian Wright, Richard Wright. 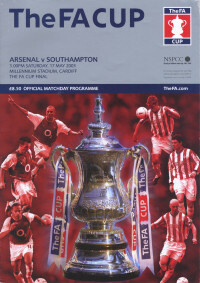 2 – Reg Lewis, Freddie Ljungberg, Ian Wright. 1 – Nicolas Anelka, Santi Cazorla, Ted Drake, Charlie George, Alex James, Bob John, Eddie Kelly, Laurent Koscielny, Jack Lambert, Andy Linighan, Marc Overmars, Ray Parlour, Robert Pires, Aaron Ramsey, Frank Stapleton, Alan Sunderland, Brian Talbot. 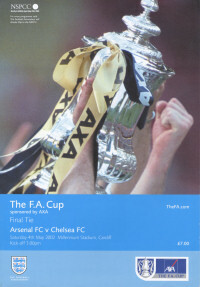 To read about the kits that Arsenal have worn in the FA Cup final, read She Wore A Yellow Ribbon. Dan Lewis, Tom Parker, Andy Kennedy, Alf Baker, Jack Butler, Bob John, Joe Hulme, Charlie Buchan (captain), Jimmy Brain, Billy Blyth, Sid Hoar. Arsenal went into their first FA Cup final as slight underdogs against the Bluebirds who had reached the final only two years earlier. 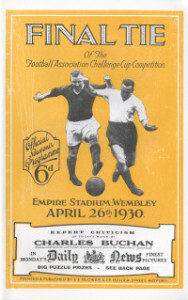 Despite having Charlie Buchan to bolster the ranks The Gunners could not break down Cardiff, and Hughie Ferguson scored the winner. 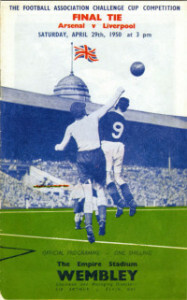 His effort slipped under Arsenal goalkeeper Dan Lewis’ body and the cup left England for the only time in its long history. Charlie Preedy, Tom Parker (captain), Eddie Hapgood, Alf Baker, Bill Seddon, Bob John, Joe Hulme, David Jack, Jack Lambert, Alex James, Cliff Bastin. 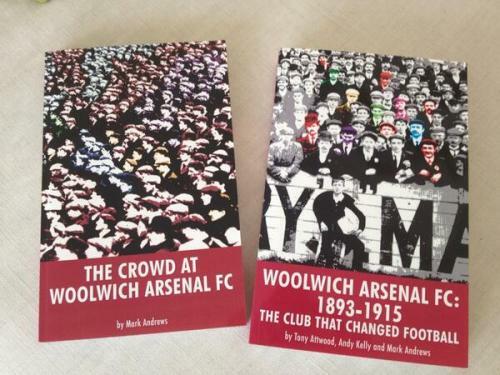 For their second final Arsenal were pitted against Herbert Chapman’s former team. 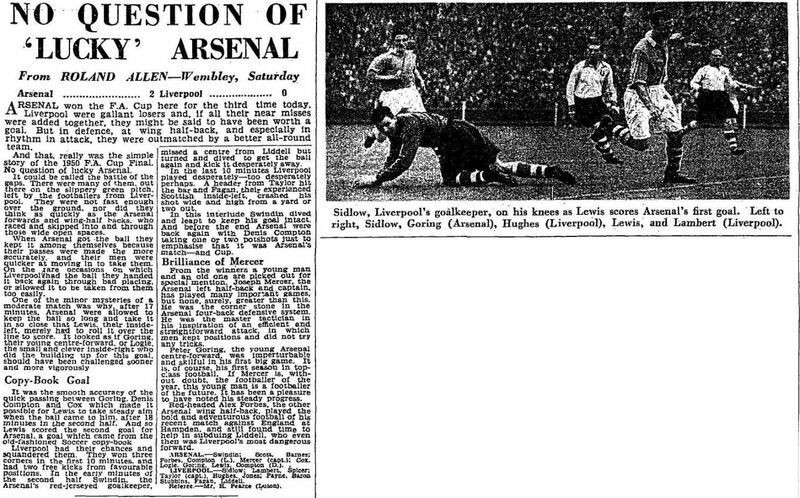 Arsenal’s first goal had been planned on the team bus on the way to the game, Alex James taking a quick free-kick to Cliff Bastin who returned the ball to the unmarked linchpin to slot home. 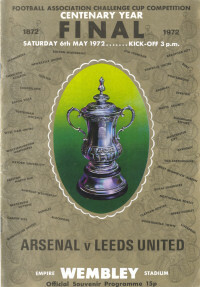 In the dying minutes a long through-ball found Jack Lambert who shrugged off the Huddersfield defenders to secure the game and Arsenal’s first major silverware. Both teams were led onto the pitch side-by-side for the first time in honour of Herbert Chapman. Frank Moss, Tom Parker (captain), Eddie Hapgood, Charlie Jones, Herbie Roberts, George Male, Joe Hulme, David Jack, Jack Lambert, Cliff Bastin, Bob John. Arsenal’s build up was thrown into turmoil as their playmaker was ruled out in a training exercise as Alex James failed to pass trainer Tom Whittaker’s test at their Brighton practice ground. Without James, Arsenal failed to match Newcastle despite going ahead from a Bob John goal. 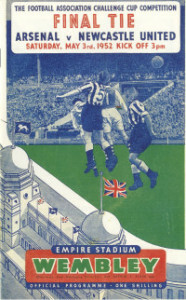 Two Jack Allen goals, one in each half, ensured Newcastle won the FA Cup for the third time. Photographic evidence proved that the cross for the Magpies first goal was made from over the goal line. However at the time the referee allowed play to continue and the goal stood. Alex Wilson, George Male, Eddie Hapgood, Jack Crayston, Herbie Roberts, Wilf Copping, Joe Hulme, Ray Bowden, Ted Drake, Alex James (captain), Cliff Bastin. 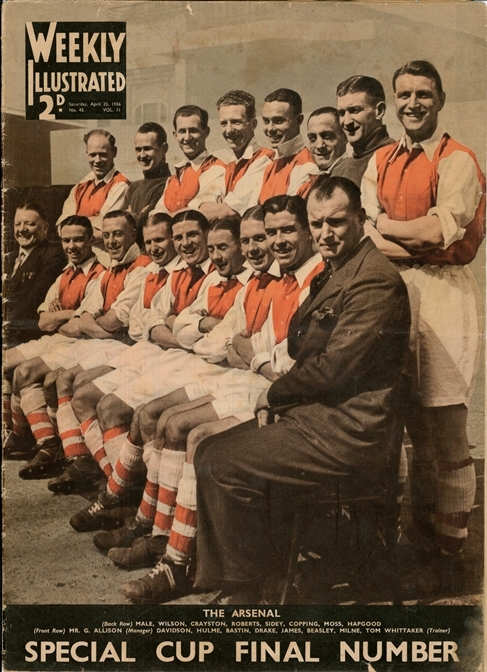 Arsenal’s team consisted of 10 internationals, with the only non-capped player being the goalkeeper, Alex Wilson. Consequently they were hot favourites, however Sheffield United rose to the occasion and on the day were marginally the better team. Nevertheless the Gunners quality eventually shone through and they scored the winner through the left foot of Ted Drake, who had recently returned to the team after a cartilage operation. 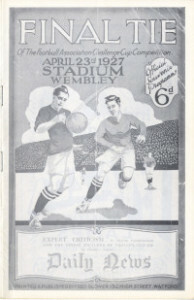 A dispute between Wembley and the newsreel companies resulted in the latter not being allowed inside the stadium to film the game. They got around this by filming from autogyros that were flown over the stadium. George Swindin, Laurie Scott, Walley Barnes, Alex Forbes, Leslie Compton, Joe Mercer (captain), Freddie Cox, Jimmy Logie, Peter Goring, Reg Lewis, Denis Compton. Goalscorer: Lewis (18 and 63). Resplendent in their old gold kit, specially made for the final, Arsenal dominated this final completely. Conditions were slippery following incessant rain beforehand, and Arsenal adapted the best. Reg Lewis’ first goal was a simple tap-in following a combination of passes masterminded by Logie. Lewis’ second goal was almost identical to his first and capped a great team effort. 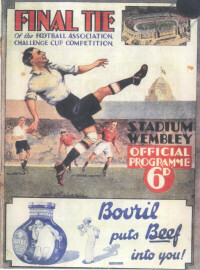 This was the first FA Cup final shown live on television. It was watched by an invited audience of 1,000 on a 20ft x 15ft screen at the Odeon Cinema in Penge. George Swindin, Walley Barnes, Lionel Smith, Alex Forbes, Ray Daniel, Joe Mercer (captain), Freddie Cox, Jimmy Logie, Cliff Holton, Doug Lishman, Don Roper. Walley Barnes left the pitch after half an hour with a knee injury meaning the Gunners played on with ten men for the rest of the match. 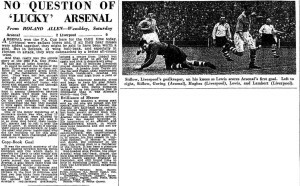 The story of the match was the Herculean effort from Arsenal’s fit players who did well to guard the goal from Newcastle’s most feared forward Jackie Milburn. 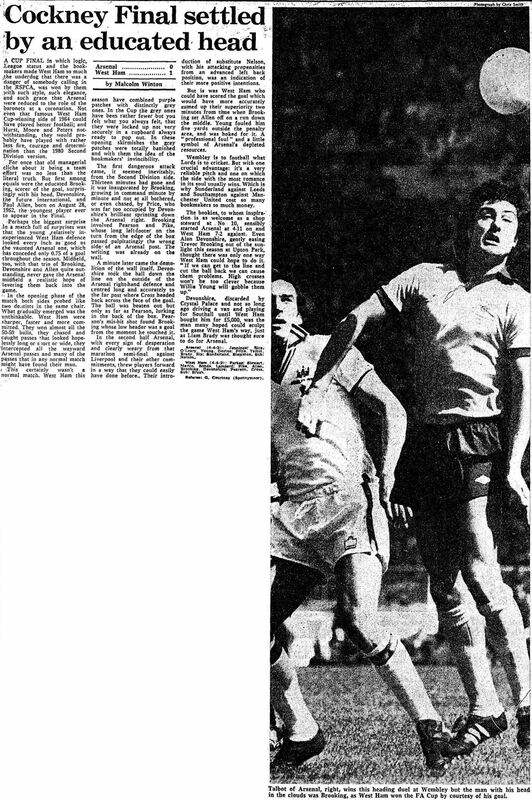 But cup-holders Newcastle won the closely contested game with a late headed winner from Chilean born striker Robledo. Wartime Prime Minister Winston Churchill was in the royal box to present the FA Cup trophy. Bob Wilson, Pat Rice, Bob McNab, Peter Storey (Eddie Kelly), Frank McLintock (captain), Peter Simpson, George Armstrong, George Graham, John Radford, Ray Kennedy, Charlie George. Goalscorers: Kelly (101), George (111). 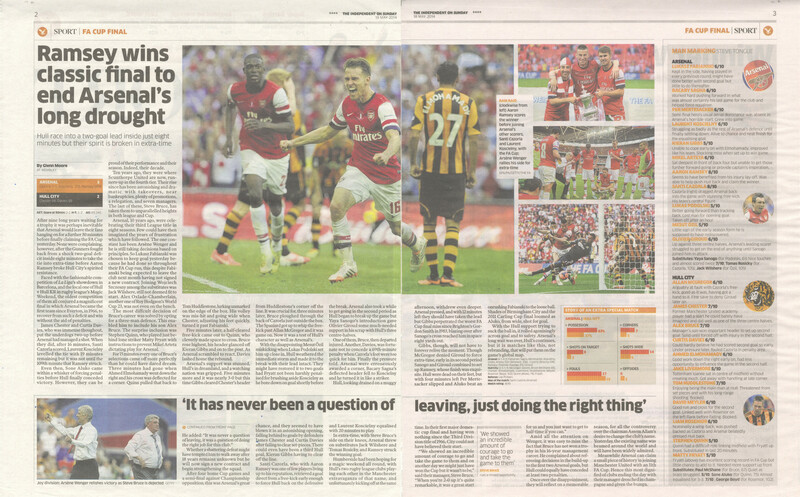 Fresh from the League title win at White Hart Lane, Arsenal dominated the play in a goalless normal time. 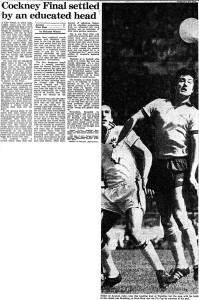 However, just into extra-time Steve Heighway scored only for Eddie Kelly, on for Peter Storey, to hit the ball goal-bound for the equaliser. In the final session of extra-time Charlie George passed the ball to Radford and got it back for George to rifle in a 20 yard scorcher. The Double was won. 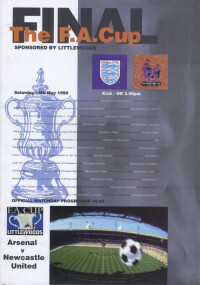 Eddie Kelly became the first substitute to score in an FA Cup final. Geoff Barnett, Pat Rice, Bob McNab, Peter Storey, Frank McLintock (captain), Peter Simpson, George Armstrong, Alan Ball, Charlie George, John Radford (Ray Kennedy), George Graham. Despite it being billed as the Centenary final it was actually the 91st final due to the intervention of the First and Second World Wars. Pat Jennings, Pat Rice (captain), Sammy Nelson, David Price, David O’Leary, Willie Young, Liam Brady (Graham Rix), Alan Sunderland, Malcolm Macdonald, Frank Stapleton, Alan Hudson. 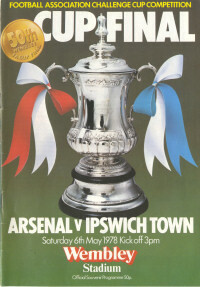 The final was a disappointment for the Gunners as an injury-hit Arsenal, despite being overwhelming favourites, did not play to their undoubted talents and were beaten by Bobby Robson’s Ipswich Town, in their only appearance in an FA Cup final. The winner was scored by Roger Osborne after Ipswich had dominated the game. 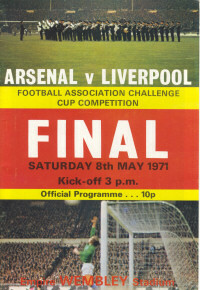 The Cup final was the only round in which Malcolm Macdonald did not score in this season’s competition. Pat Jennings, Pat Rice (captain), Sammy Nelson, Brian Talbot, David O’Leary, Willie Young, Liam Brady, Alan Sunderland, Frank Stapleton, David Price (Steve Walford), Graham Rix. Goalscorers: Talbot (12), Stapleton (43), Sunderland (89). 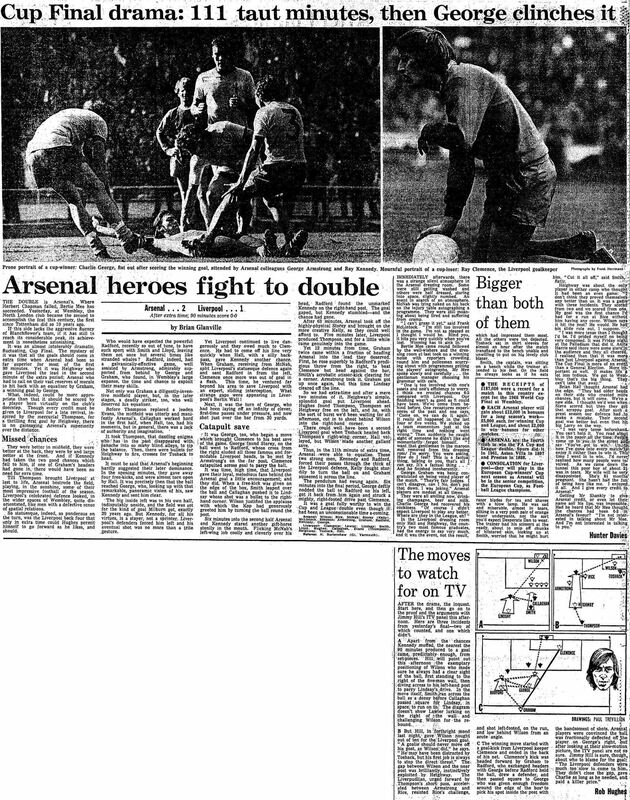 Goals by Brian Talbot and Frank Stapleton before half time gave the Gunners a two goal lead into the half time break. 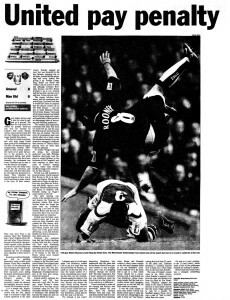 Arsenal exerted a stranglehold on the match but after David Price was substituted near the end, Manchester United scored twice in quick succession. 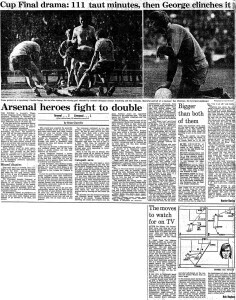 With extra-time looming Liam Brady and Graham Rix combined for Alan Sunderland to score. Cue the celebrations both on the pitch and the Wembley terraces. This match is often referred to as the “Five Minute Final” owing to the exciting finale. Pat Jennings, Pat Rice (captain), John Devine (Sammy Nelson), Brian Talbot, David O’Leary, Willie Young, Liam Brady, Alan Sunderland, Frank Stapleton, David Price, Graham Rix. 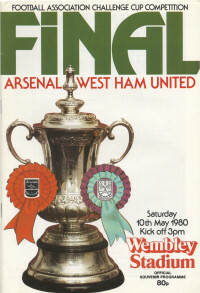 Trevor Brooking and Alan Devonshire controlled the midfield, as Arsenal created few chances. 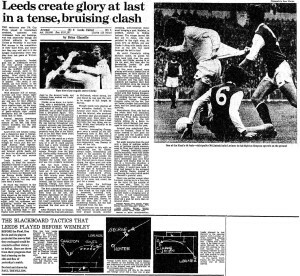 Brooking scored with a low header and from then on West Ham never really looked in trouble. This final is remembered for Willie Young’s foul on Paul Allen minutes from time as he moved in on goal just outside the penalty area. Young received a yellow card and the administrators moved in to alter the professional foul rules. 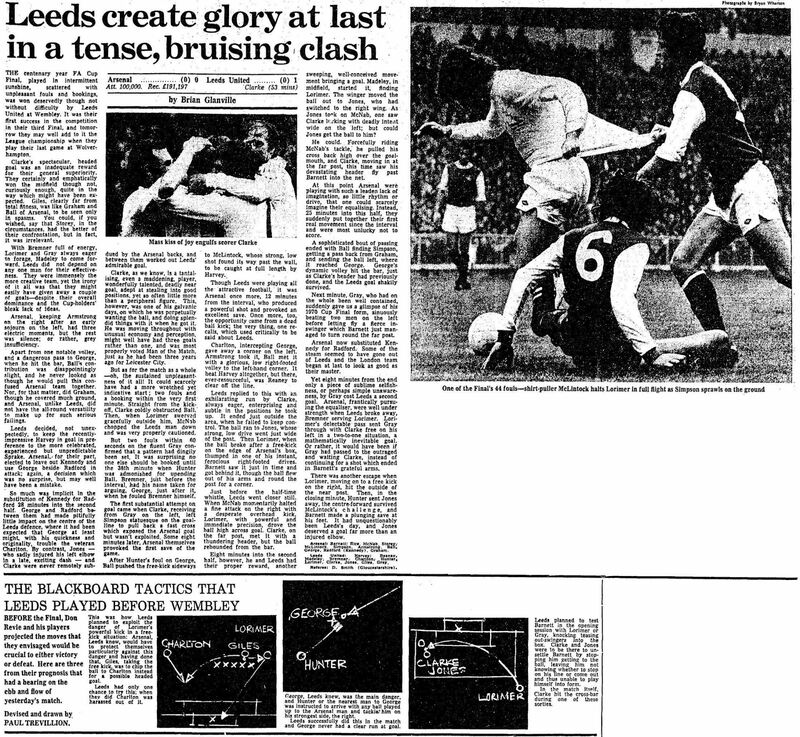 West Ham had been drawn as the “home” team but chose to wear their change kit of all white. Arsenal had to wear their away kit due to a clash of colour between the shorts. David Seaman, Lee Dixon, Andy Linighan, Tony Adams (captain), Nigel Winterburn, Paul Merson, Paul Davis, John Jensen, Ray Parlour (Alan Smith), Kevin Campbell, Ian Wright (David O’Leary). It was unsurprising that these two teams produced a draw having played each other just nine days before and for the fourth time this season. 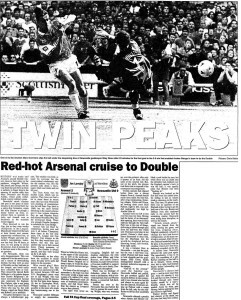 This resulted in a dour game in which both teams cancelled each other out except for two typical examples of goal-poaching. 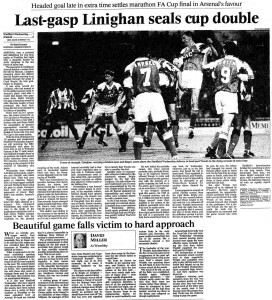 An Ian Wright header from a set-piece put Arsenal ahead whilst David Hirst converted a Mark Bright header from close range. 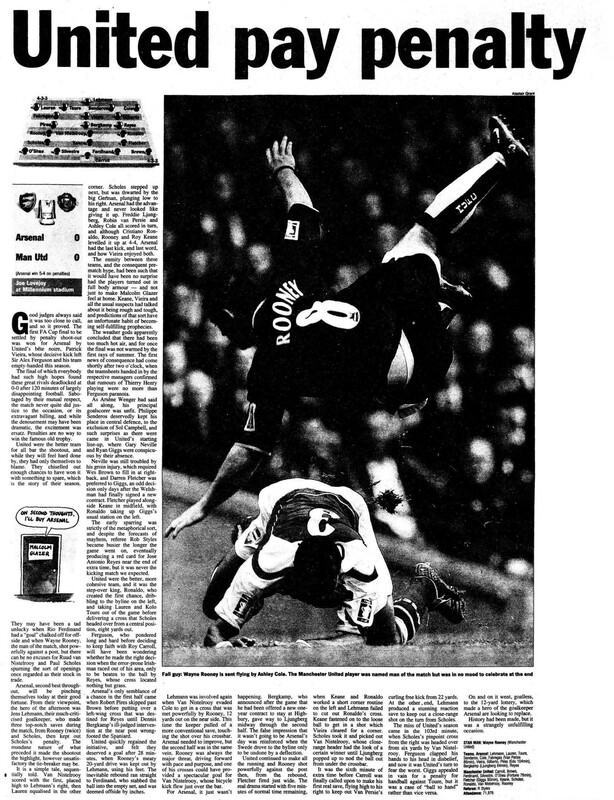 Before the game, Steve Morrow collected his League Cup winner’s medal, having broken his arm at the end of that final following some high-jinks from Tony Adams. David Seaman, Lee Dixon, Andy Linighan, Tony Adams (captain), Nigel Winterburn, Paul Merson, Paul Davis, John Jensen, Kevin Campbell, Alan Smith, Ian Wright (David O’Leary). Goalscorers: Wright (34), Linighan (119). Arsenal, in the last ever FA Cup final replay, became the first team to win the domestic cup double with a very late headed winner from Andy Linighan at rain swept Wembley. 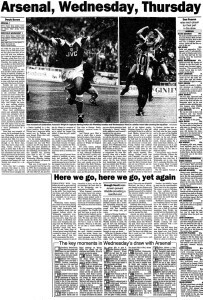 The Gunners had taken the lead in front of a low crowd of 62,267 after Ian Wright ran onto a Alan Smith flick and shot past Chris Woods, only for Wednesday to equalise with a deflected Chris Waddle shot past David Seaman. 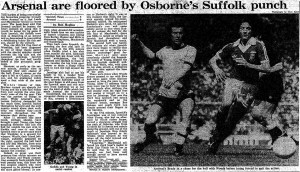 David O’Leary won his second FA Cup winner’s medal fourteen years after his first, the longest gap for a player. David Seaman, Lee Dixon, Tony Adams (captain), Martin Keown, Nigel Winterburn, Ray Parlour, Patrick Vieira, Emmanuel Petit, Marc Overmars, Christopher Wreh (David Platt), Nicolas Anelka. Goalscorers: Overmars (23), Anelka (69). Arsenal were strong favourites to win the FA Cup even without the injured Dennis Bergkamp and Ian Wright. Marc Overmars settled any Arsenal nerves when he prodded an Emmanuel Petit through-ball between Shay Given’s legs. Alan Shearer hit the post in the second-half before Nicolas Anelka clinched Arsenal’s second Double when he shrugged off Steve Howey and produced a great finish from just inside the penalty area. 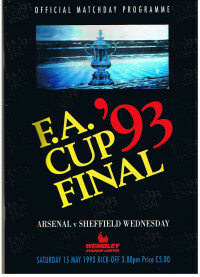 Tony Adams became the first Arsenal captain to lead his side to two FA Cup final wins. David Seaman, Lee Dixon (Dennis Bergkamp), Martin Keown, Tony Adams (captain), Ashley Cole, Robert Pires, Gilles Grimandi, Patrick Vieira, Freddie Ljungberg (Nwankwo Kanu), Sylvain Wiltord (Ray Parlour), Thierry Henry. 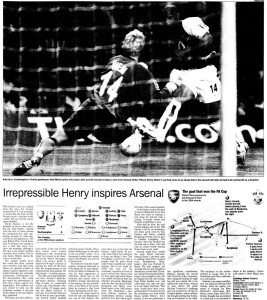 A relatively quiet first half ended goalless, but after quarter of an hour Arsenal were inexplicably denied a penalty when a Thierry Henry goal bound shot was handled on the line by Stephane Henchoz. 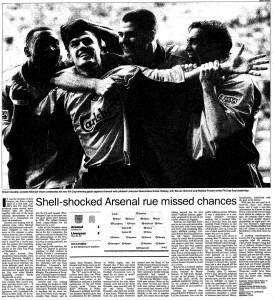 The Gunners dominated exchanges in the second-half and went ahead from Freddie Ljungberg, only for Michael Owen to score a late brace to deny Arsenal in the Cardiff sunshine. 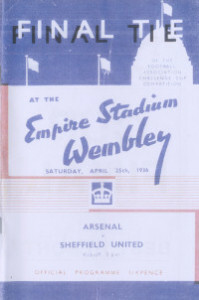 This was the first time the FA Cup final had been played outside of England, due to the Wembley redevelopment plan. David Seaman, Lauren, Sol Campbell, Tony Adams (captain), Ashley Cole, Sylvain Wiltord (Martin Keown), Ray Parlour, Patrick Vieira, Freddie Ljungberg, Dennis Bergkamp (Edu), Thierry Henry (Nwankwo Kanu). Goalscorers: Parlour (70), Ljungberg (80). Although both sides were graced with world-class forwards, they were matched by two goalkeepers of equal stature. 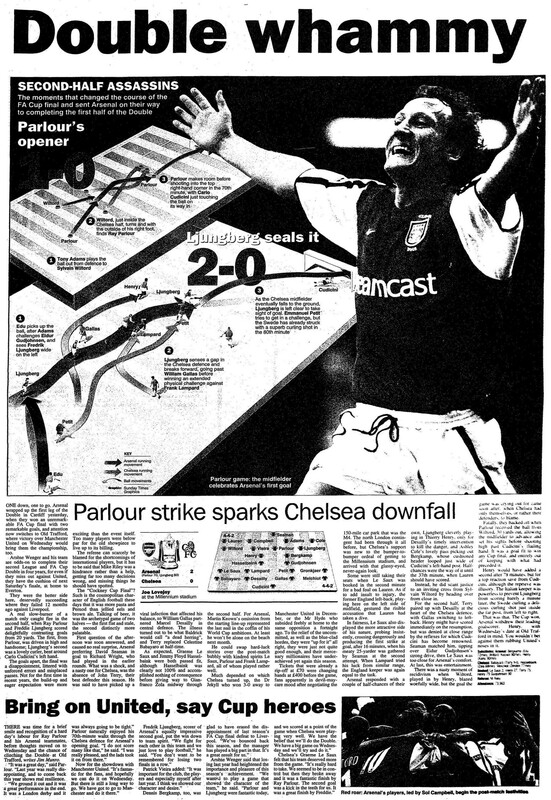 The deadlock was finally broken when “it’s only Ray Parlour” scored with a curling shot inside Cudicini’s left post from 25 yards out. Ten minutes later man of the match Freddie Ljungberg scored with an almost identical goal, to which Chelsea had no answer. 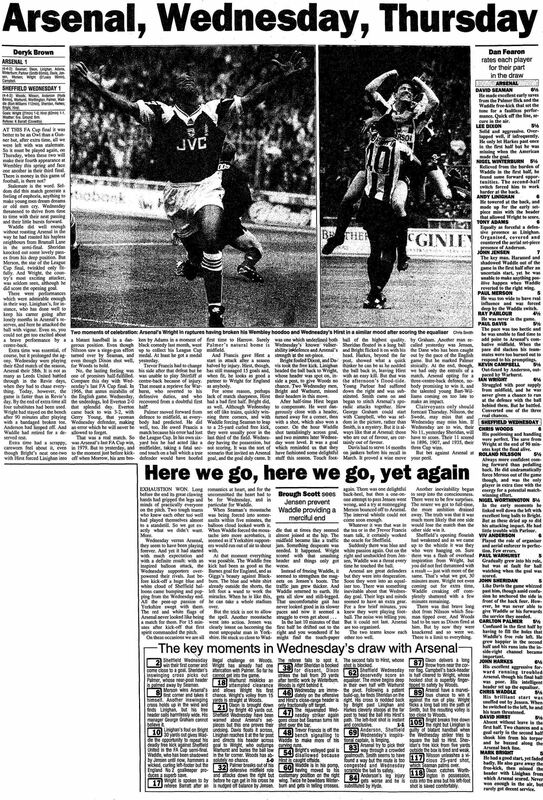 This win set Arsenal up for their third Double which was won four days later at Old Trafford. 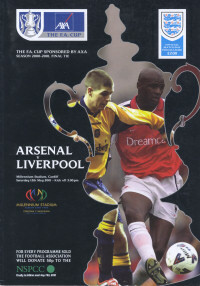 Freddie Ljungberg became the first player in 40 years to score in successive FA Cup finals. David Seaman (captain), Lauren, Martin Keown, Oleg Luzhny, Ashley Cole, Robert Pires, Ray Parlour, Gilberto Silva, Freddie Ljungberg, Dennis Bergkamp (Sylvain Wiltord), Thierry Henry. 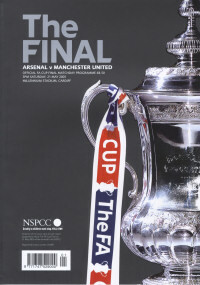 Arsenal retained the FA Cup for the first time in the club’s history, in this all-Premiership clash, with a Robert Pires shot from short range. 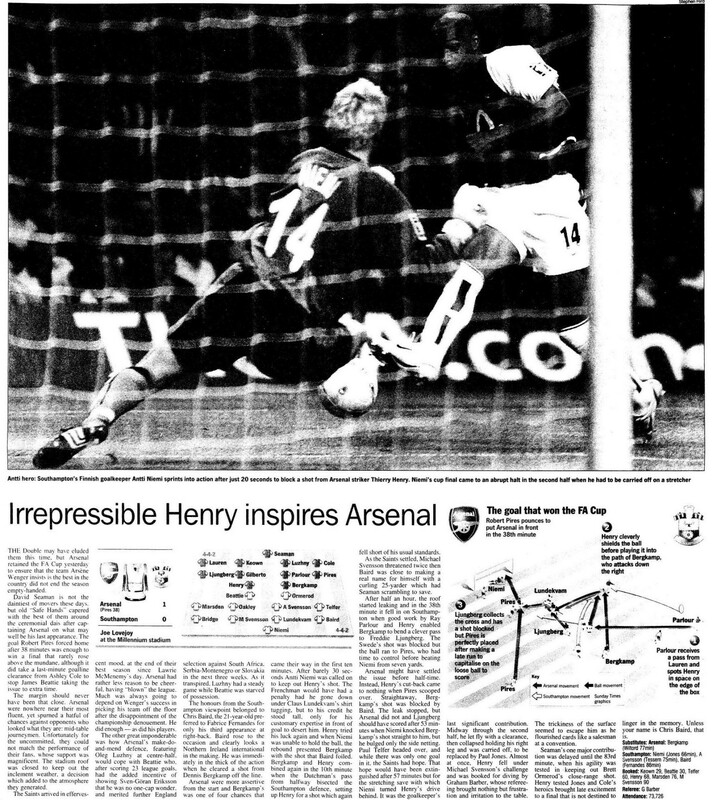 The Gunners were hot pre-match favourites and the gulf in class on the pitch was reflected in their almost total dominance, especially shown in the form of Dennis Bergkamp and man of the match Thierry Henry. This was the first FA Cup Final to be played indoors as the Millennium Stadium retractable roof was closed due to the poor weather. Jens Lehmann, Lauren, Kolo Toure, Philippe Senderos, Ashley Cole, Cesc Fabregas (Robin van Persie), Patrick Vieira (captain), Gilberto Silva, Robert Pires (Edu), Jose Antonio Reyes, Dennis Bergkamp (Freddie Ljungberg). Penalty scorers: Lauren, Ljungberg, van Persie, Cole, Vieira. Arsene Wenger changed from his usual attacking tactics to a holding game, looking to contain Manchester United’s forwards. The result was a game of few chances and no goals. As the game headed towards penalties, Arsenal were dealt a blow as Reyes was sent-off for a second bookable offence. Nine of the ten penalties were converted, the last being Patrick Vieira’s last kick for the club which sealed Arsenal’s tenth FA Cup win. 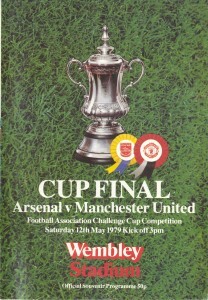 This was the first FA Cup final to be decided by a penalty shoot-out. Lukasz Fabianski, Bacary Sagna, Per Mertesacker, Laurent Koscielny, Kieran Gibbs, Mikel Arteta, Aaron Ramsey, Santi Cazorla (Tomas Rosicky), Mesut Ozil (Jack Wilshere), Lukas Podolski (Yaya Sanogo), Olivier Giroud. Scorers: Cazorla (17), Koscielny (71), Ramsey (109). Arsenal made the worst possible start, conceding two goals within the opening nine minutes. 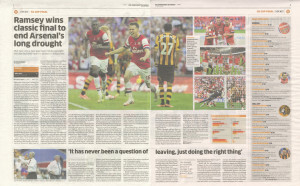 It could have been game over a few minutes later had Kieran Gibbs not headed Alex Bruce’s looping header off the line. Santi Cazorla’s free-kick brought Arsenal back into the game, and Laurent Koscielny levelled the scores midway through the second half. Aaron Ramsey fired home the winner from Olivier Giroud’s backheel to complete an amazing comeback. Hull could have grabbed an equaliser as Lukasz Fabianski went walkabouts but Aluko couldn’t find the net from an acute angle.